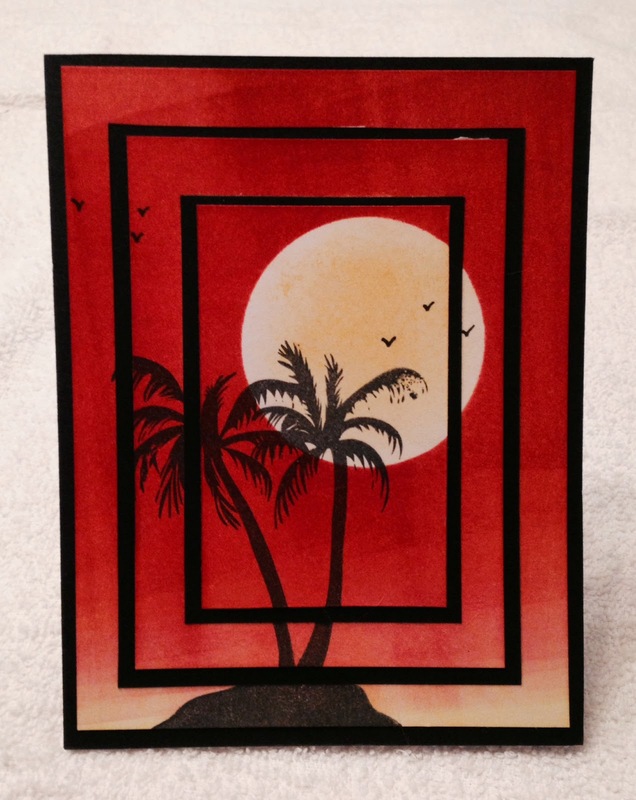 Suzanne made this sultry tropical scene card. The palm trees shadowed in the twilight moon is gorgeous. 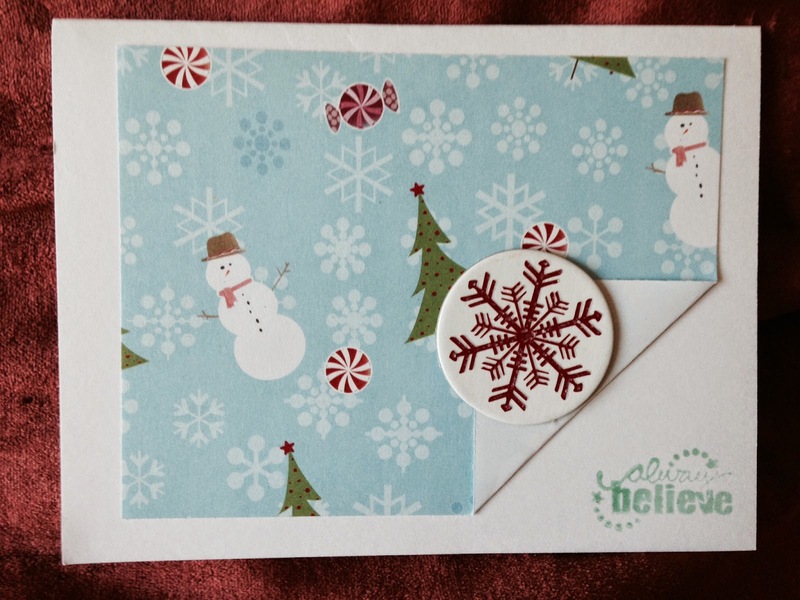 The layering gives this card tremendous depth. 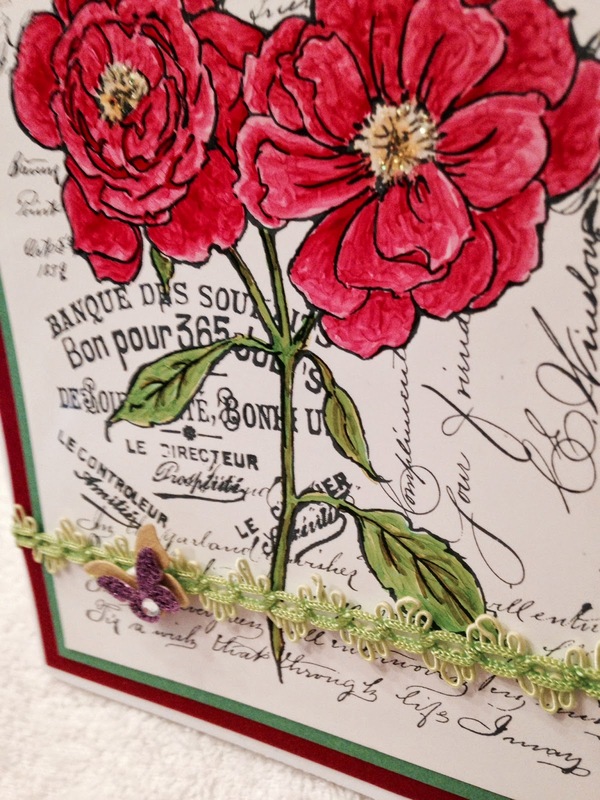 Beautiful card Suzanne. 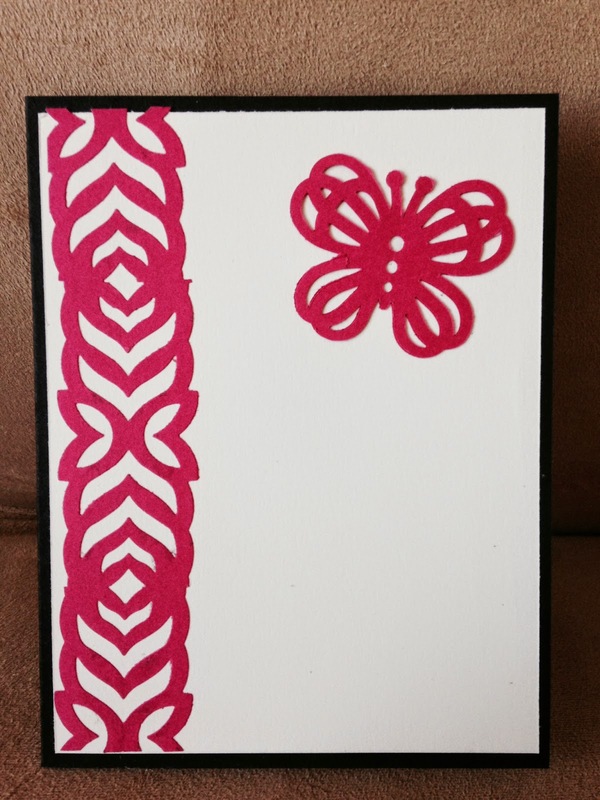 Carolyn made this bright and springy card. The colours and design are really clean and cheery. 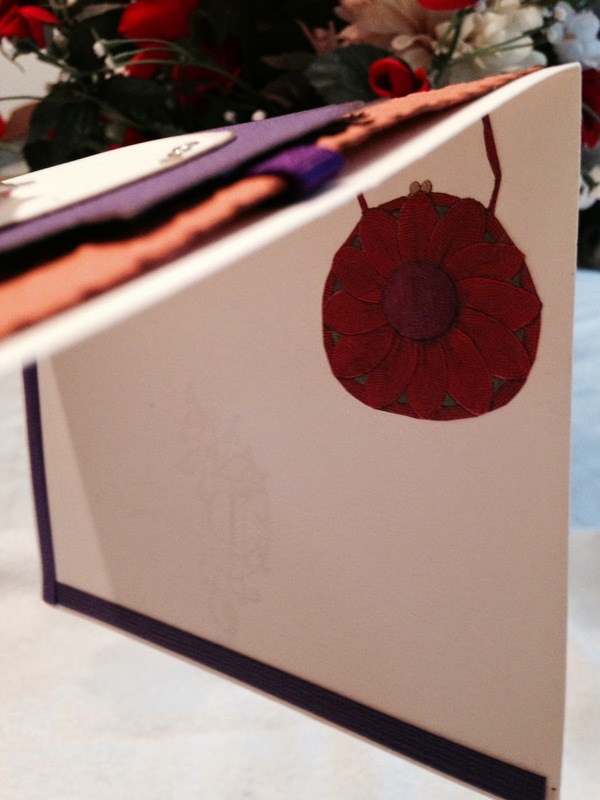 I love the flower detail on the envelope as well. Great card Carolyn. 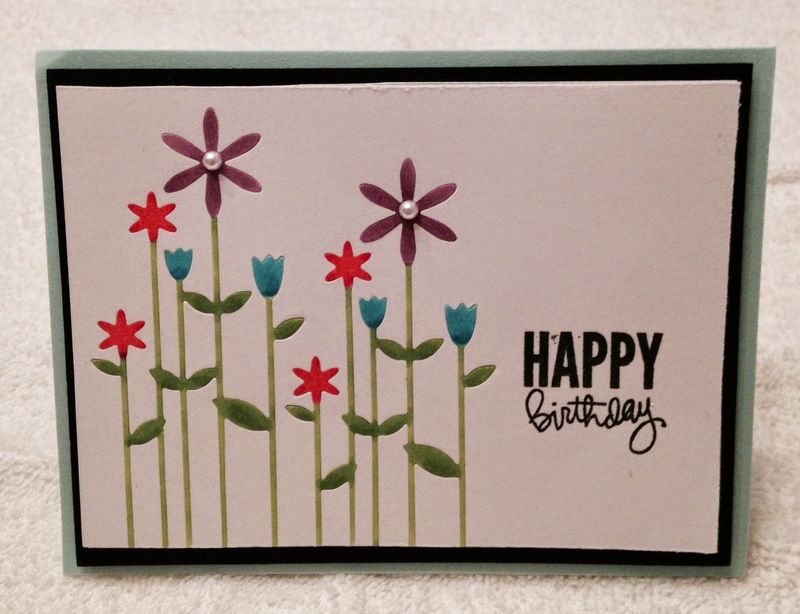 Pauline made this cool digital card. 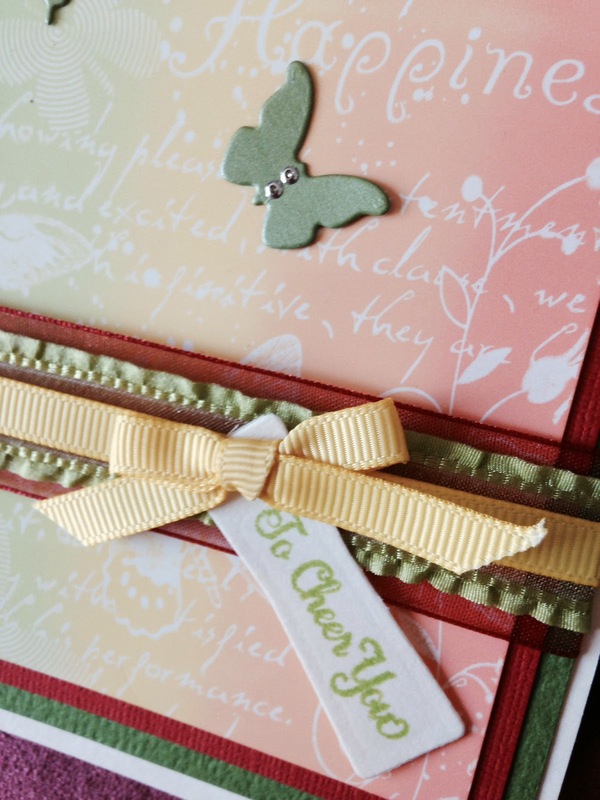 I love the bright colours, cheery elements and journaling details on the inside of the card. 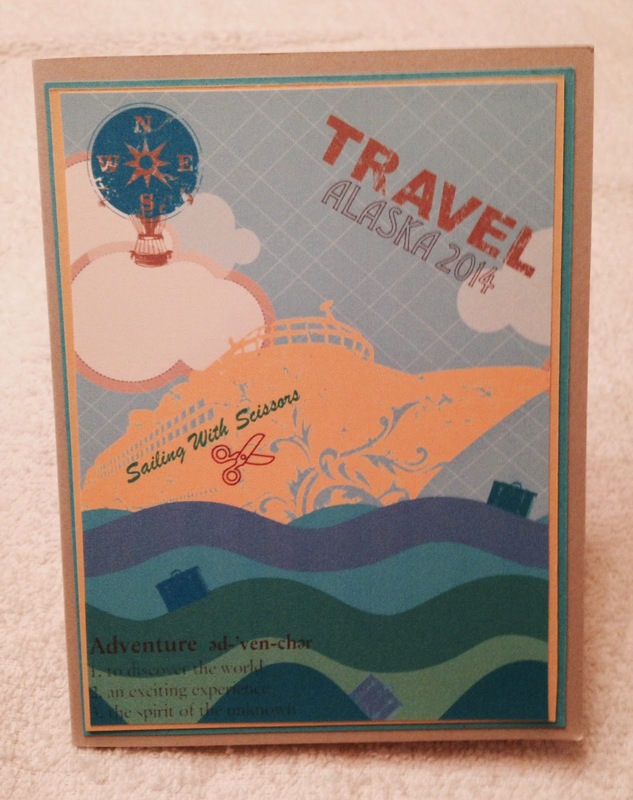 The reference to the cruise and our group makes this card really special. 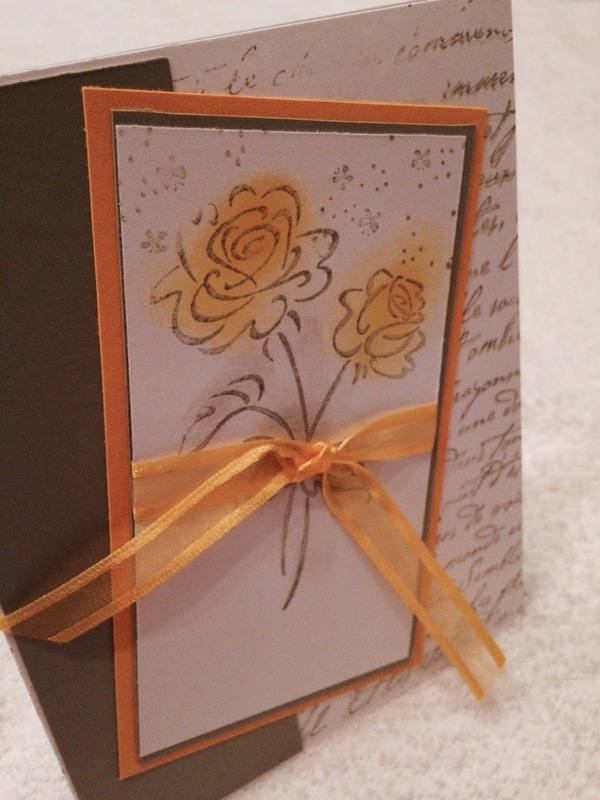 In addition, Pauline had broken her dominant arm prior to making her awesome card for the swap. Wow Pauline - you're a trooper! 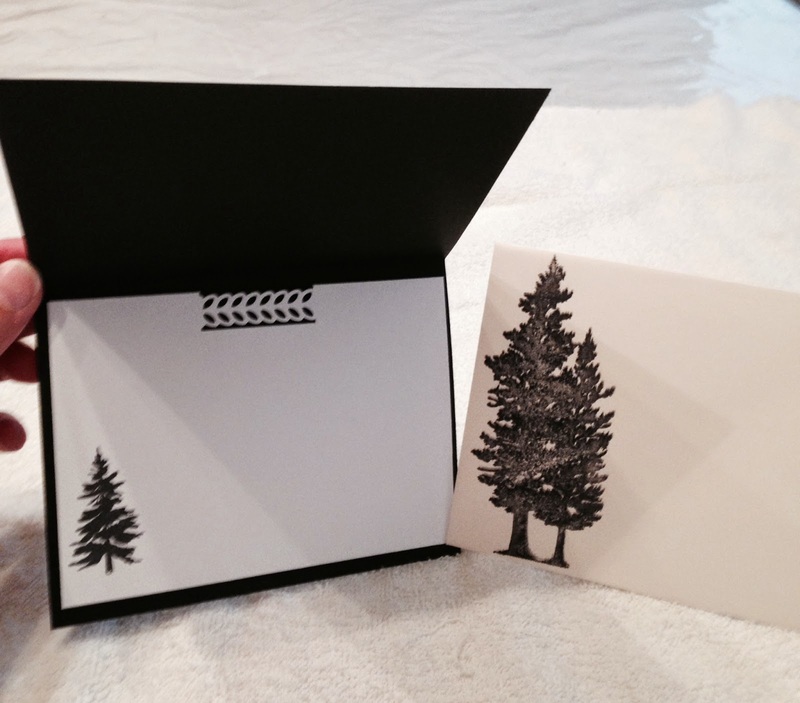 Mary Jo made this dainty card. 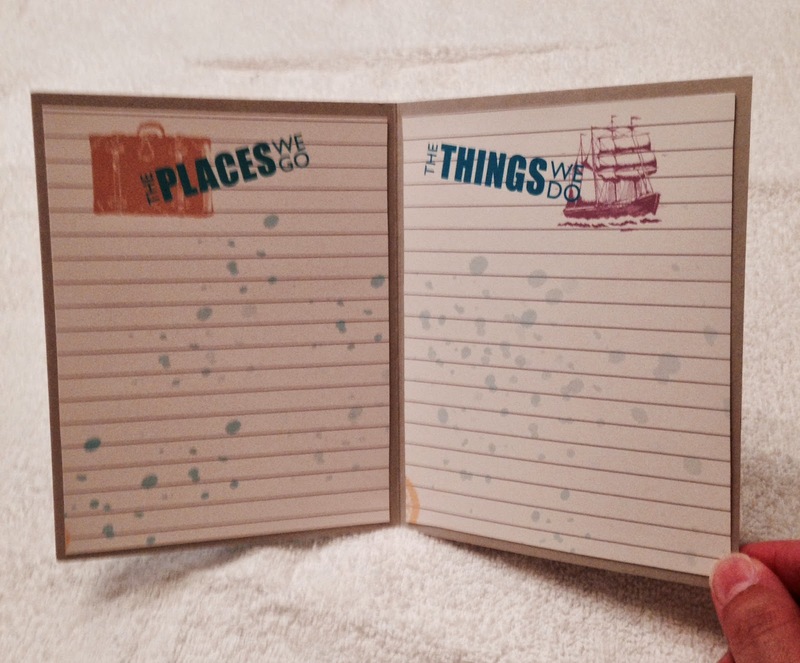 I like Mary Jo's use of a script stamp for the background. 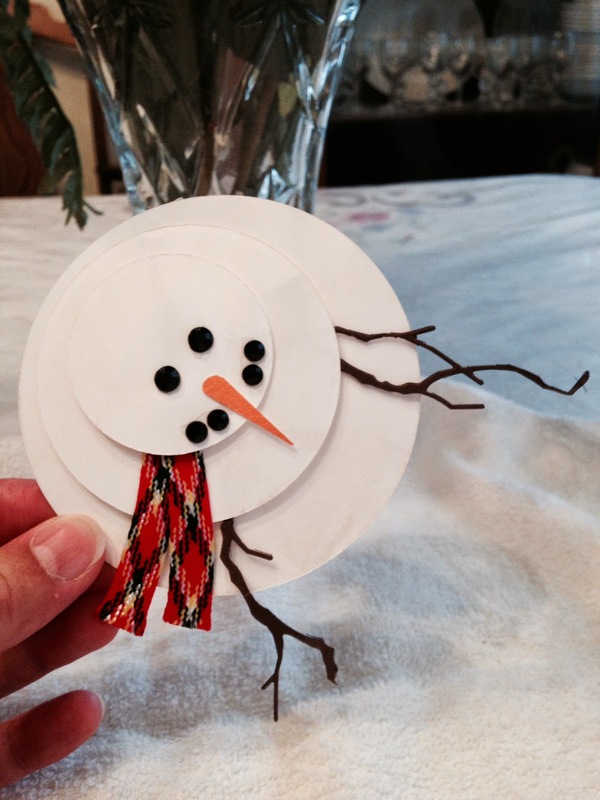 It is a pretty alternative to decorative paper. I will definitely make a mental note of this technique. 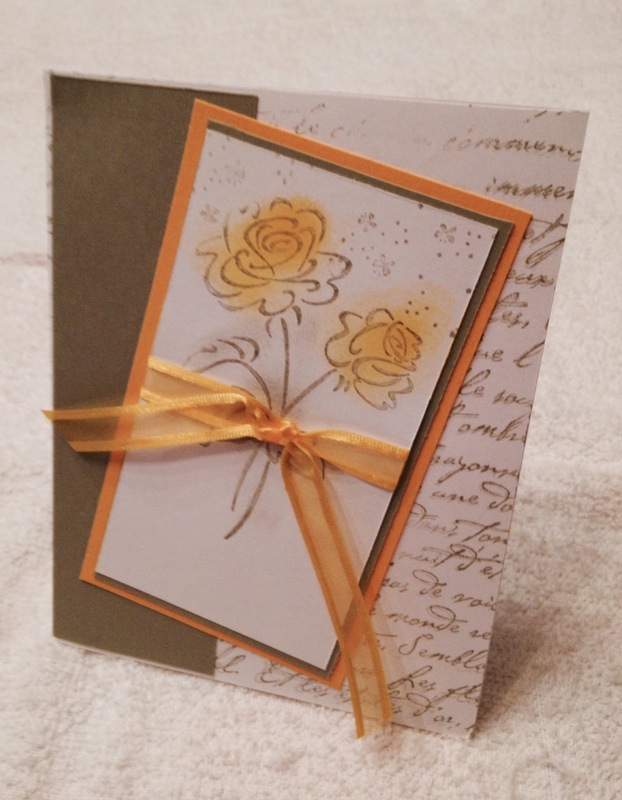 The ribbon turns the flowers into a Spring time bouquet. 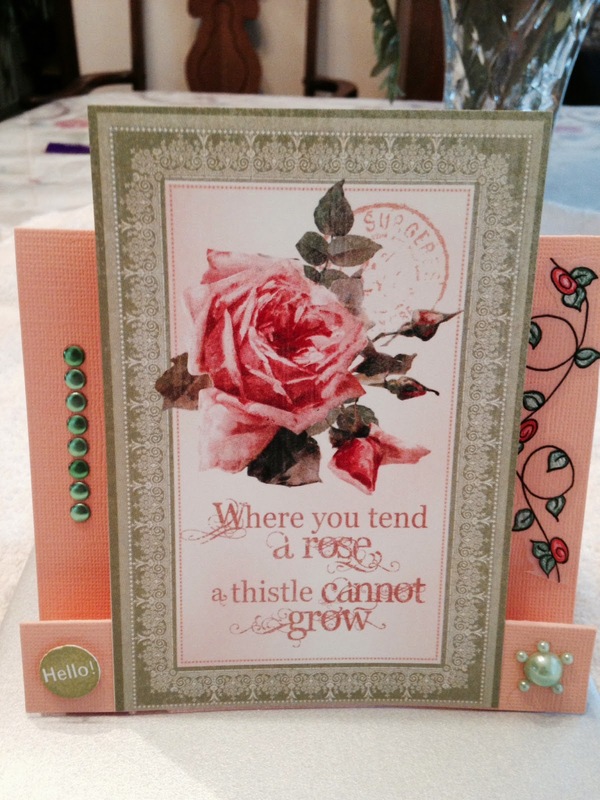 Very lovely card Mary Jo. 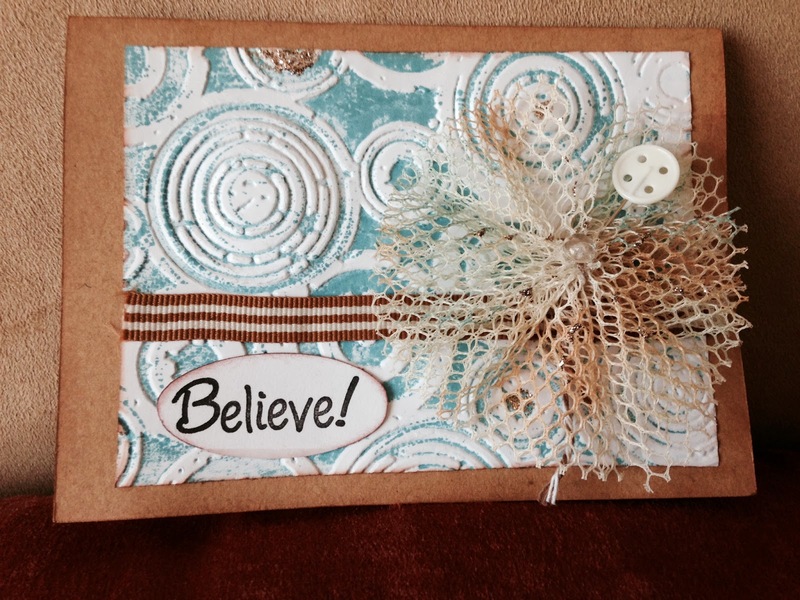 Jessie made this resist technique card. 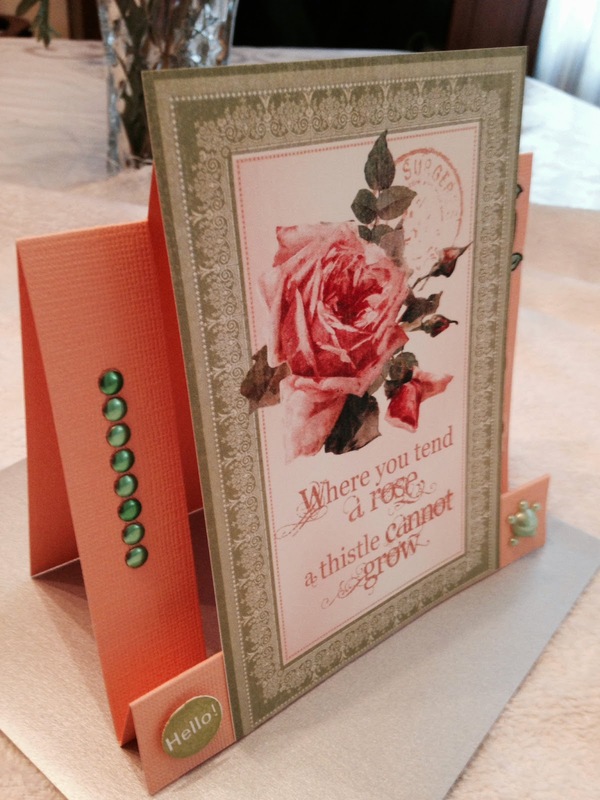 The coral and green in the background really make the white embossing stand out. 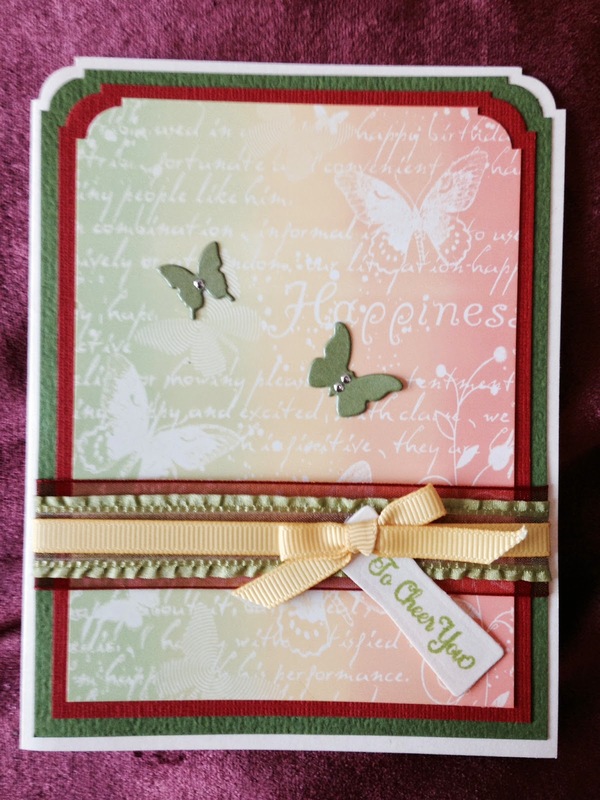 The colours are cheery and the overall look of this card is beautiful. 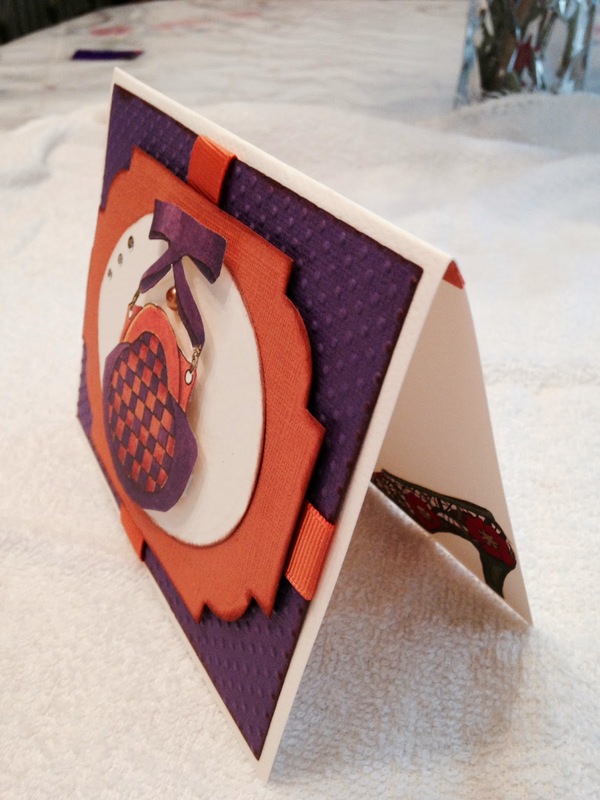 Irresistible card Jessie. 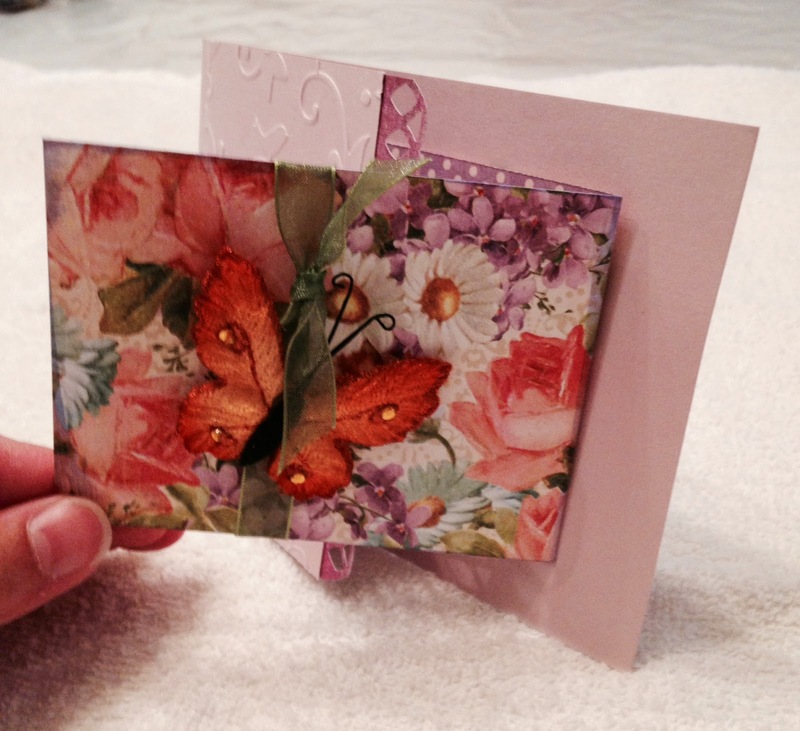 Linda made this collage flower card. 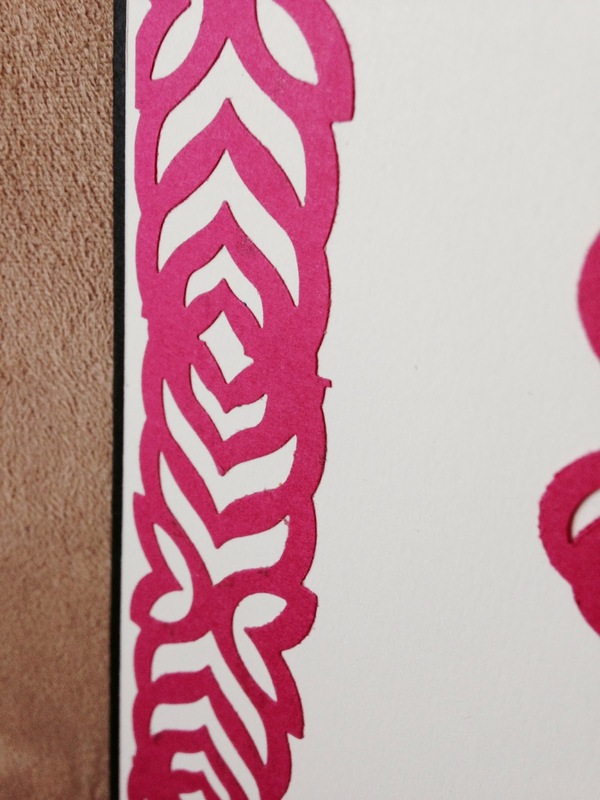 The flower petals are shaded with lots of depth. 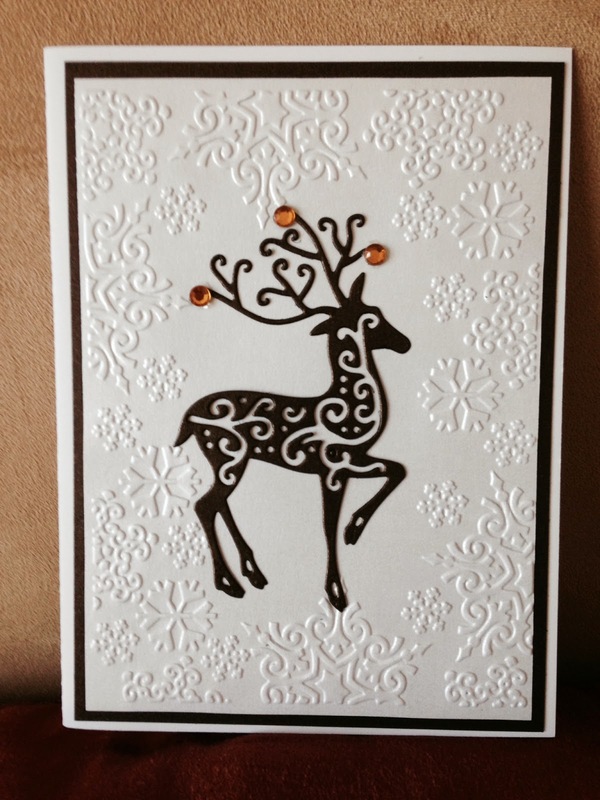 The card has a European feel to it. 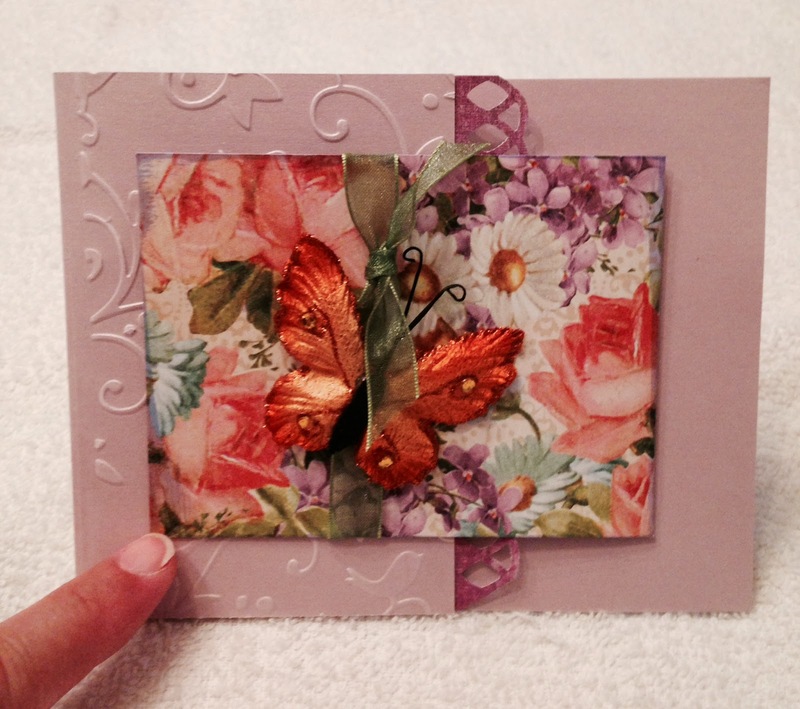 I love the glittery butterfly accent. 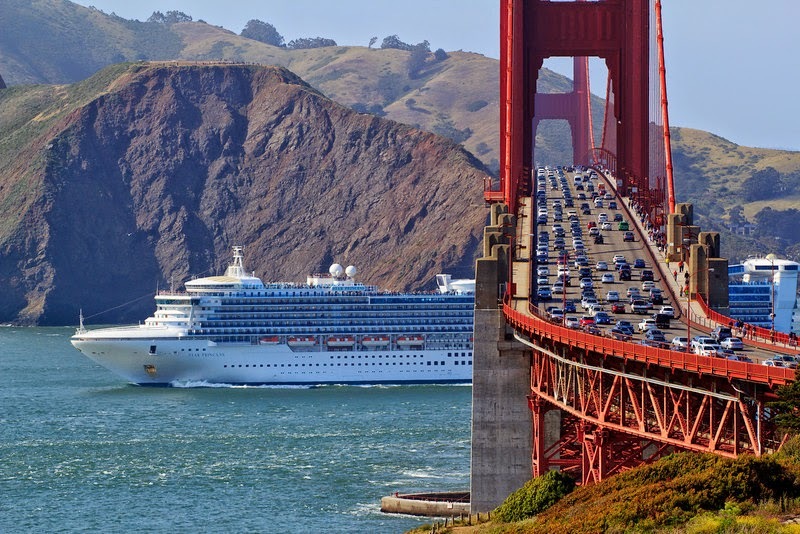 Magnifique Linda! 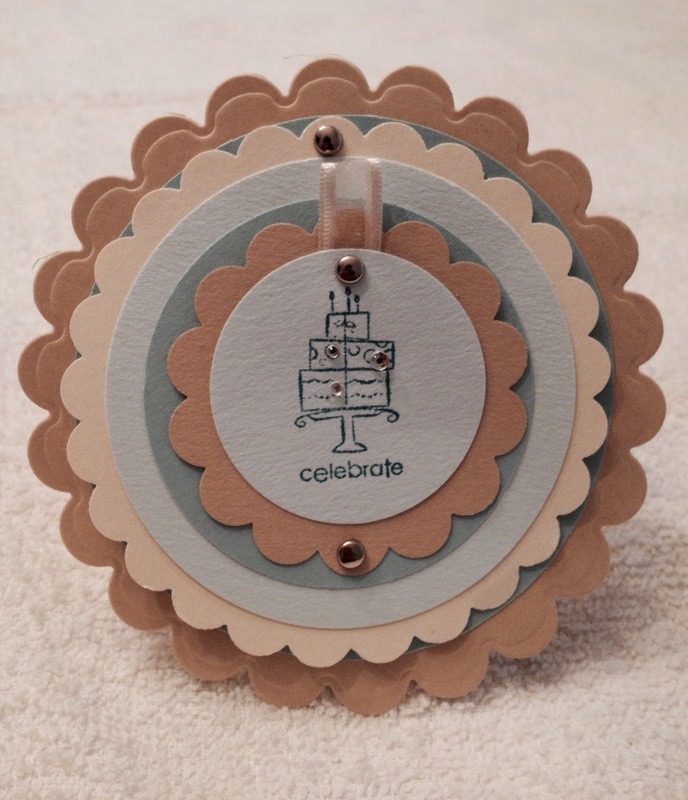 Barb created this classy dimensional card. 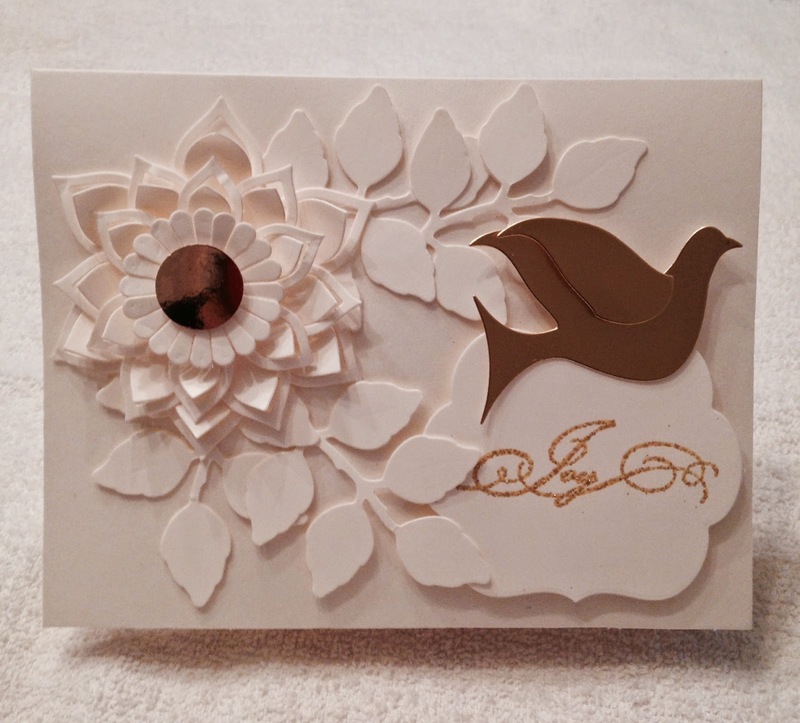 The cream layers and gold accents of this card make it pop off the page. 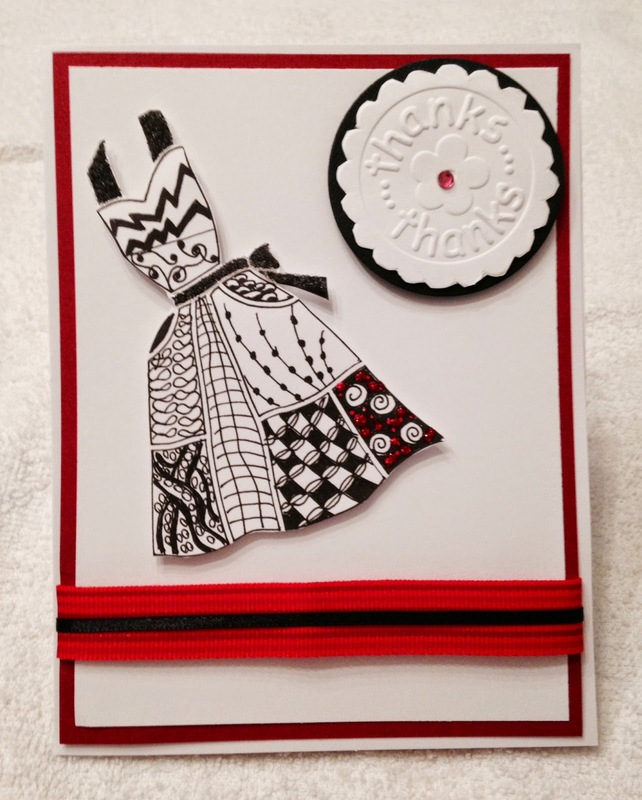 Beautiful card Barb. 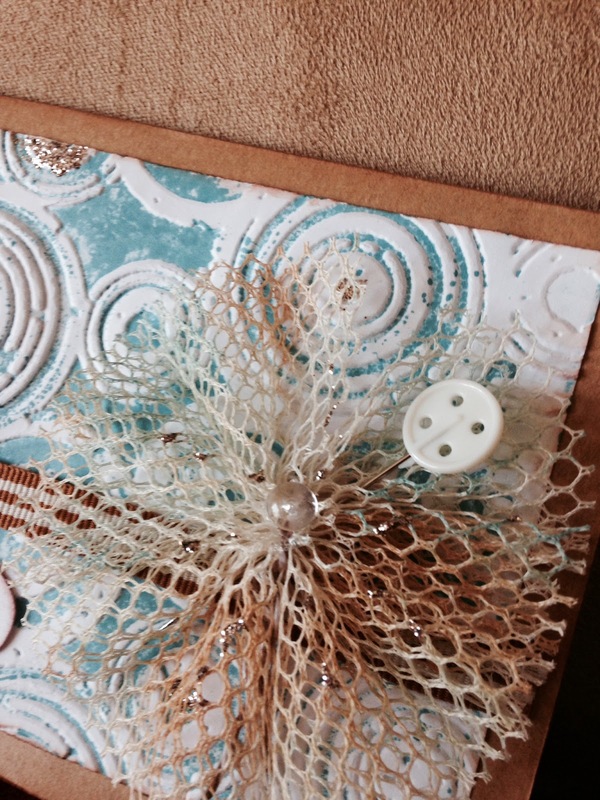 Leslie made this beautiful card which looks like a variation of the tri-shutter card. 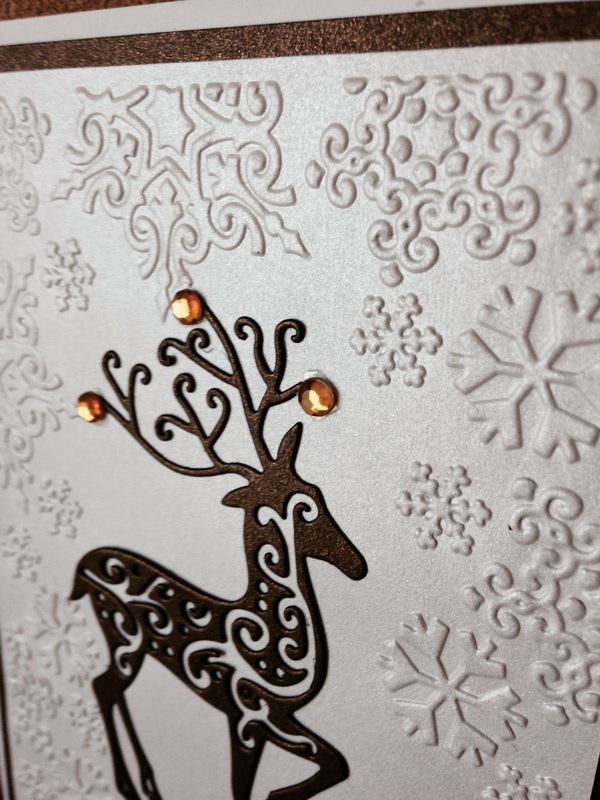 The shimmery paper, the focal butterfly, the scrumptious decorative paper all add up to a gorgeous card. Great job Leslie. 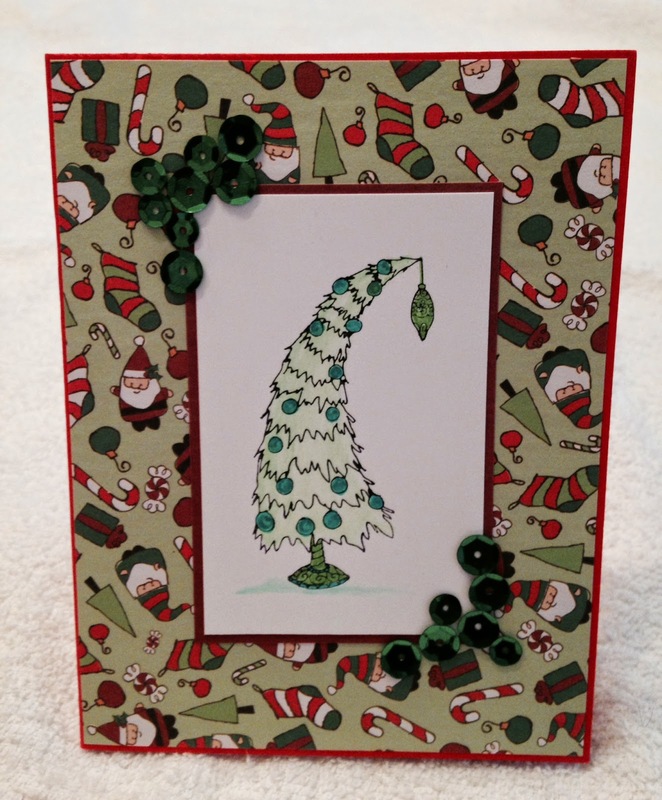 Here is my card for the swap. 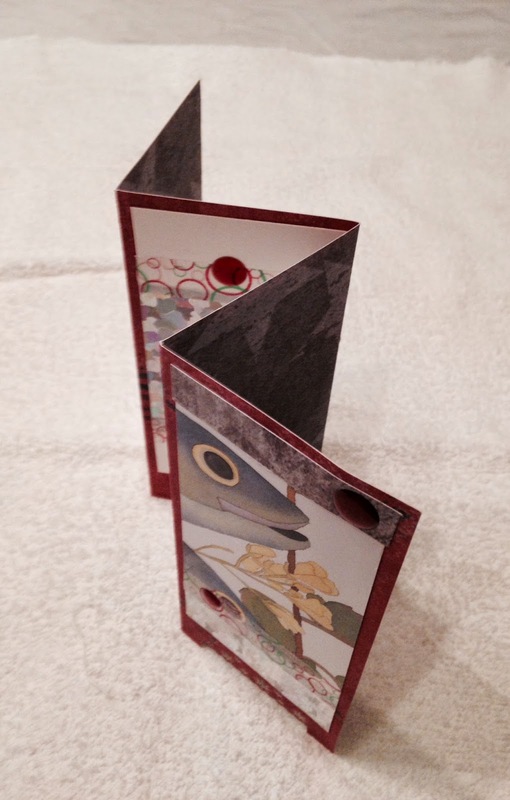 It is a gift card holder card which doesn't require additional postage when mailing. 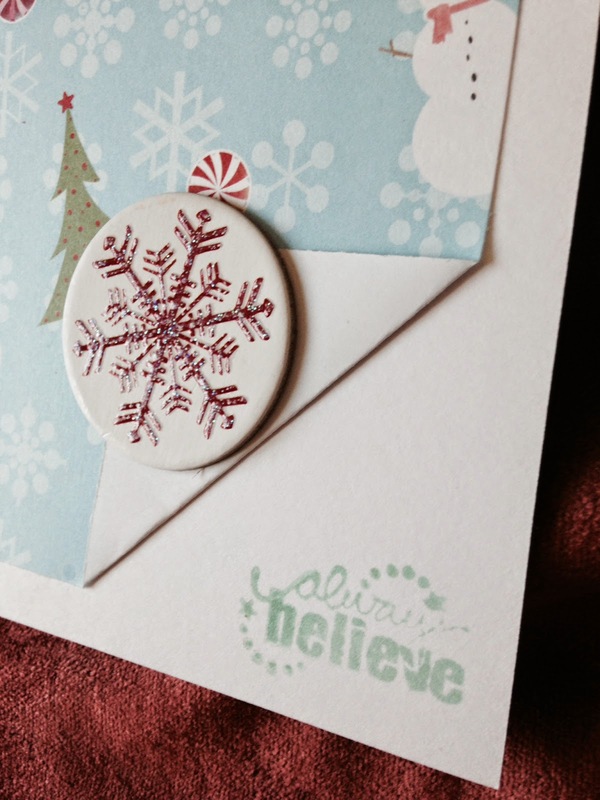 The cute little tree stamp was a Christmas present from my dear friend Karen, last year. Adhering all the sequins to the cards was a bit of a pain, to say the least. I'm still finding sequins in the carpeting. Ha ha. 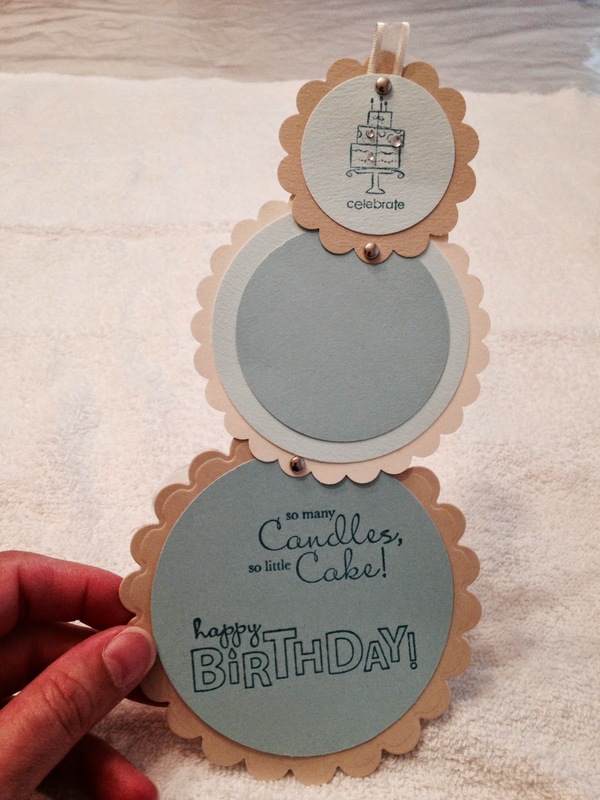 Michelle made this adorable multi-layer cake card. 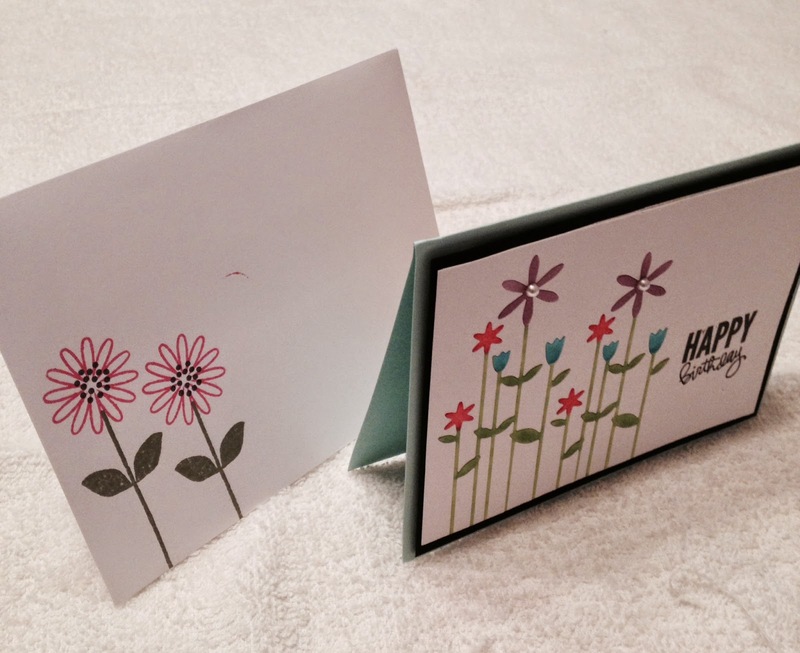 What a really cute and original style of card. 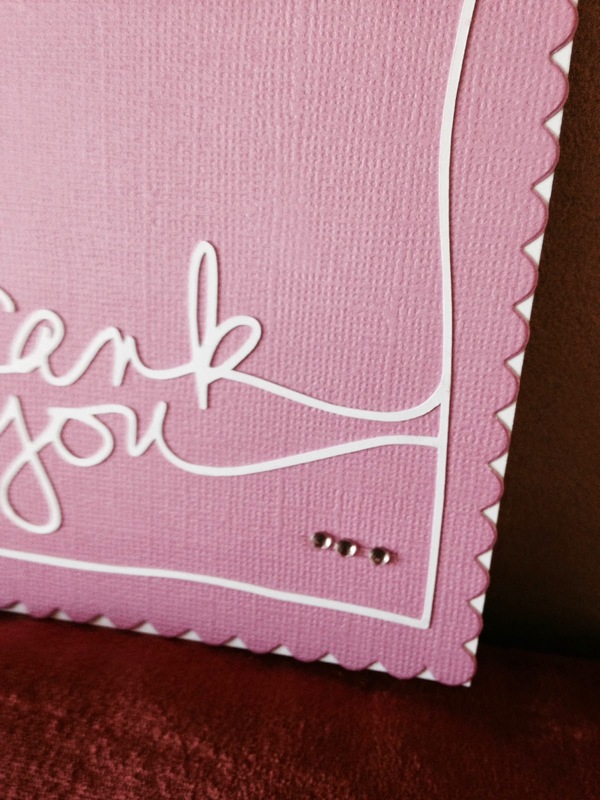 It has lots of room for a sentiment as well as a personal message. 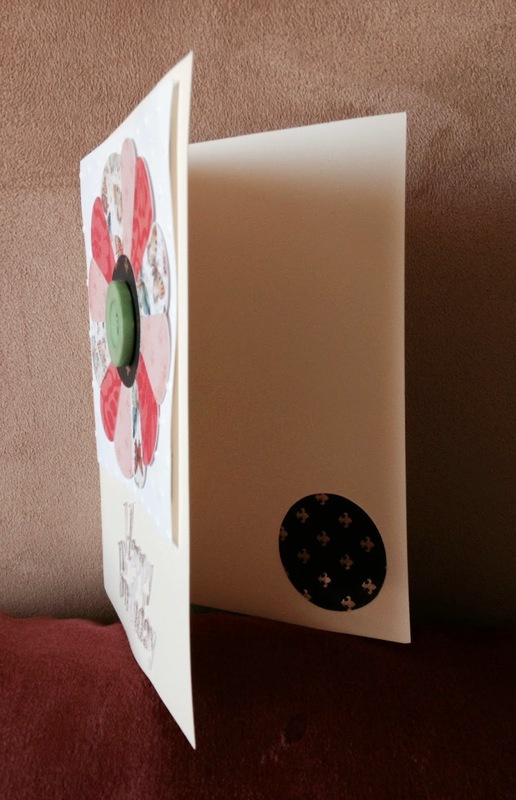 Very yummy looking card Michelle. 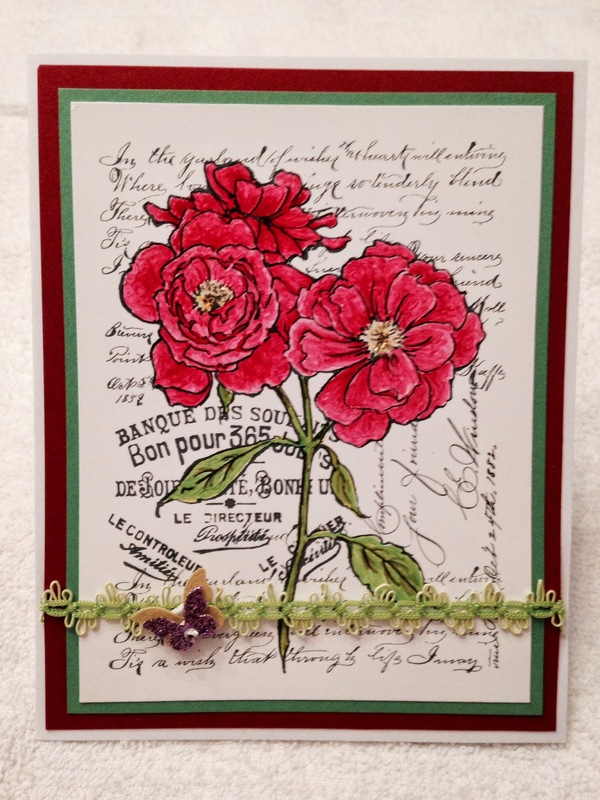 Darlene made this incredible Stampscapes card. 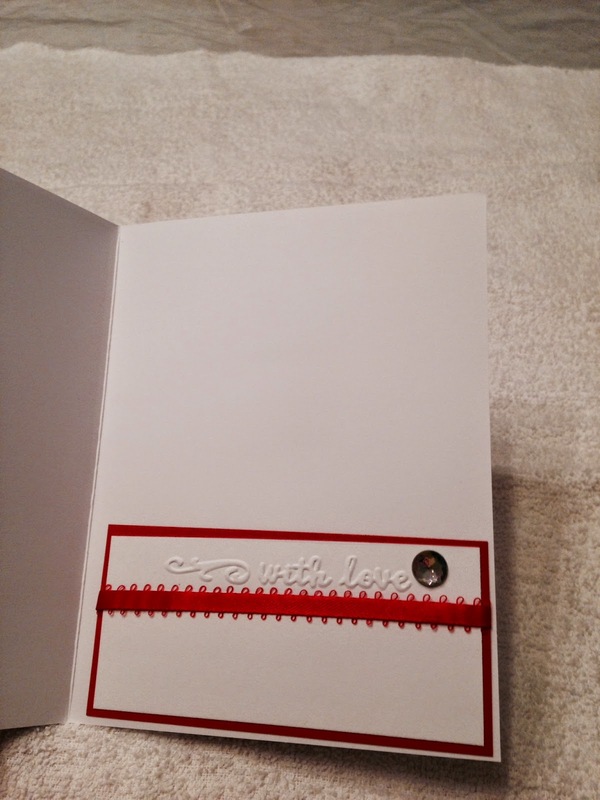 Stampscape cards can be challenging because you must stamp all the different element stamps on the cardstock perfectly or one of these elements can look out of place. 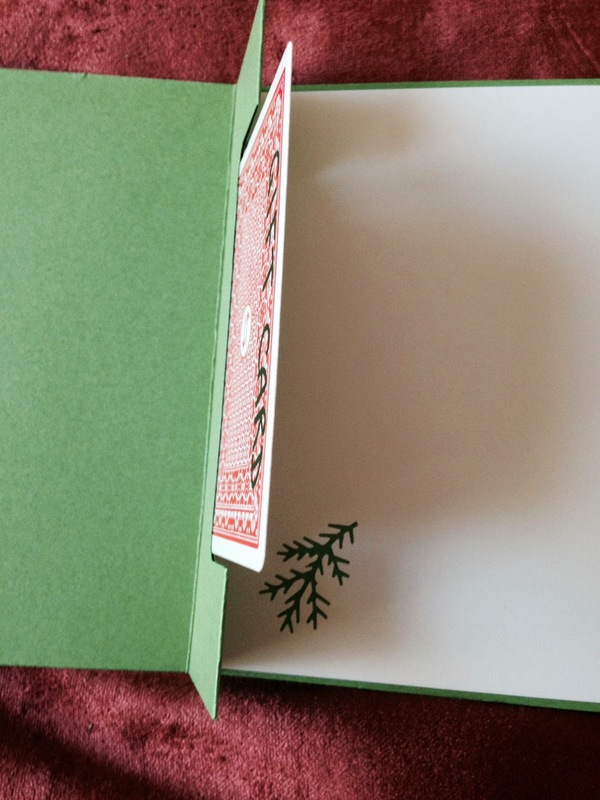 Darlene definitely has mastered this technique because the card is beautiful. Nice job Darlene. 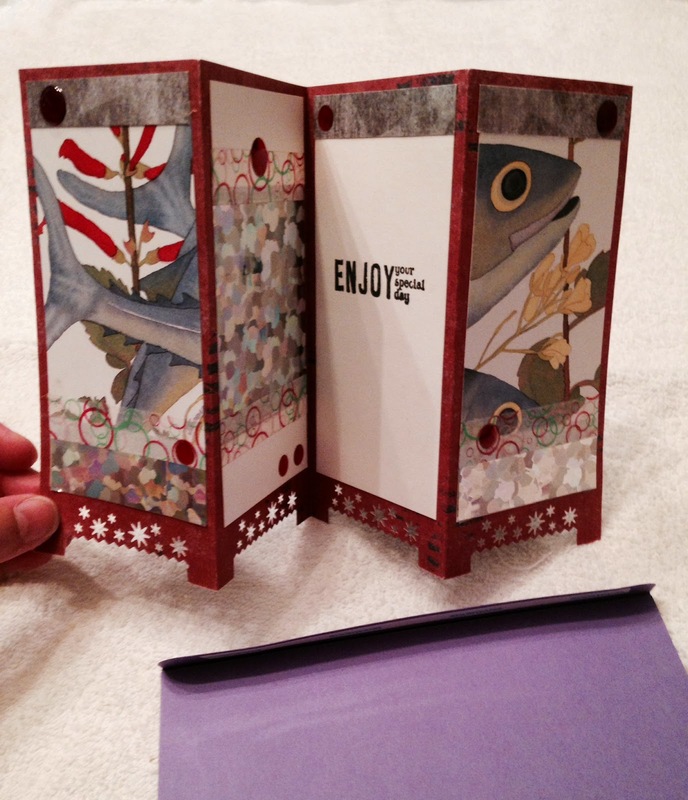 Gayle made this adorable card. 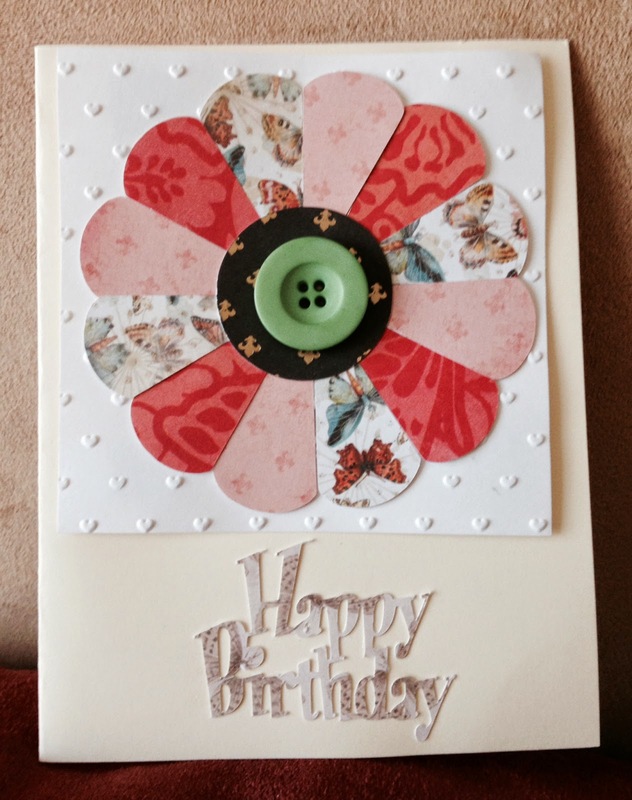 She made this card in different colours for the swap. 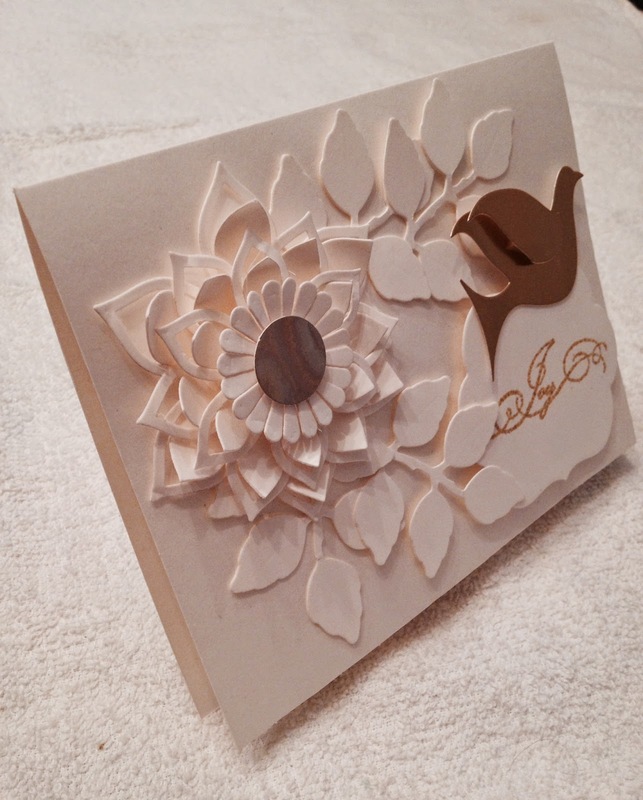 She put lots of time putting together all the little die cut pieces. I love the inside sentiment. Very cute card Gayle! 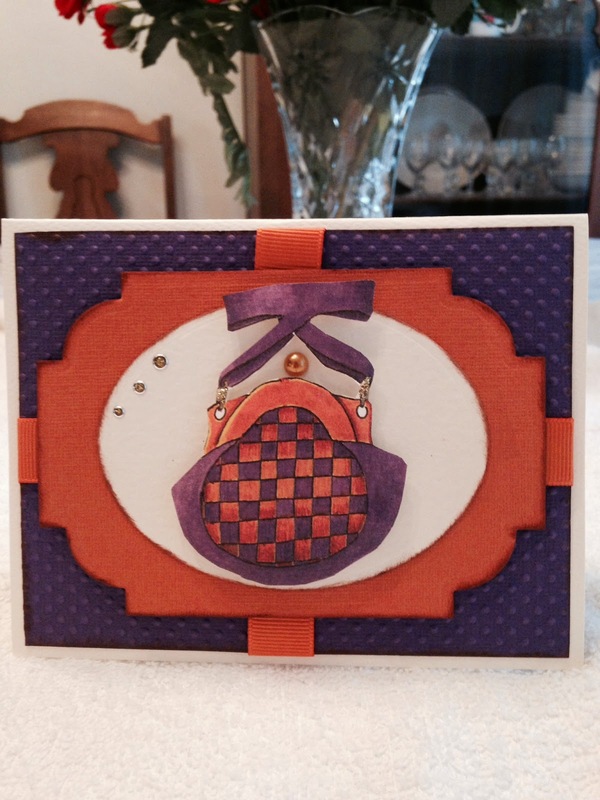 Charlene made this cute purse card that matches Diane's card. 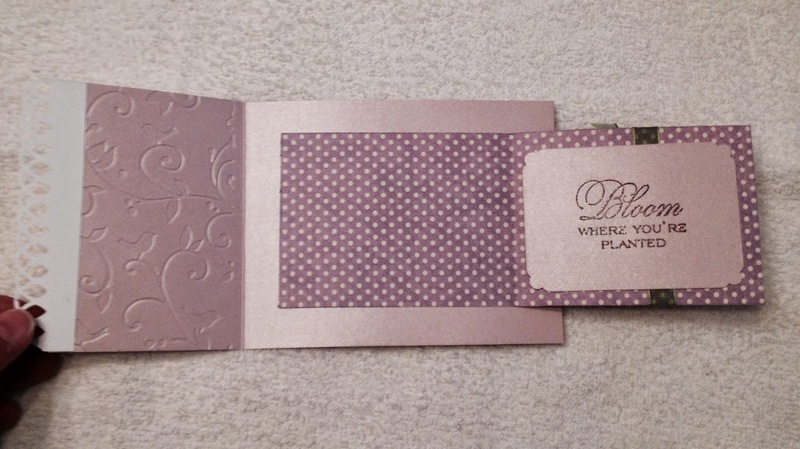 The inside detail of the card as well as it's design really makes the card pop. 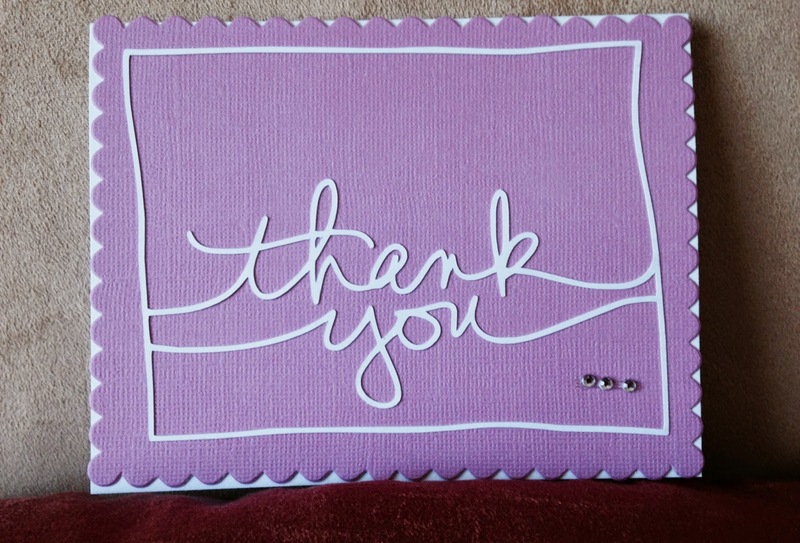 Very nice card Charlene. 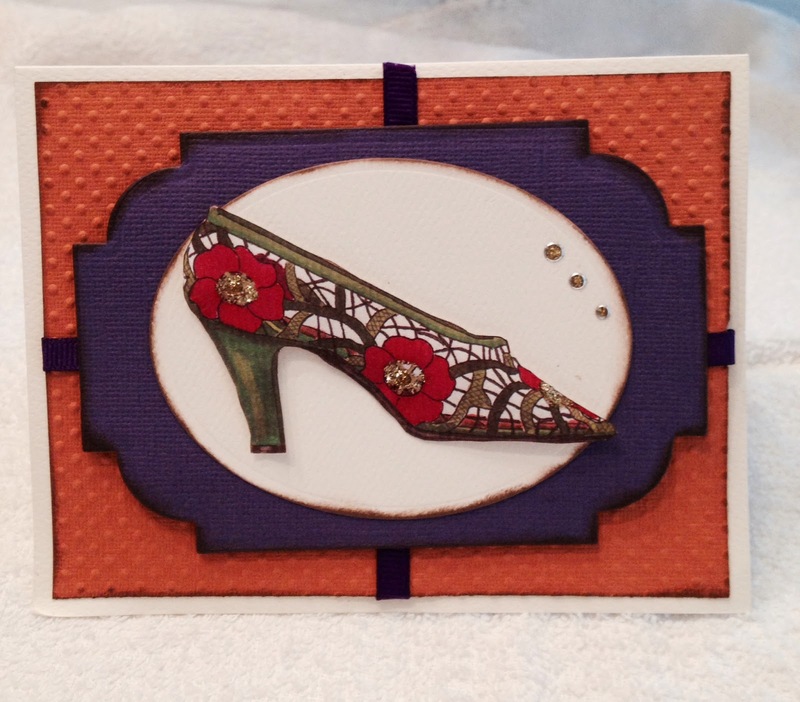 Diane made this cool card of a framed Victorian shoe. The colours she chose were warm and cozy. Notice the detail in her colouring. Great job Diane. 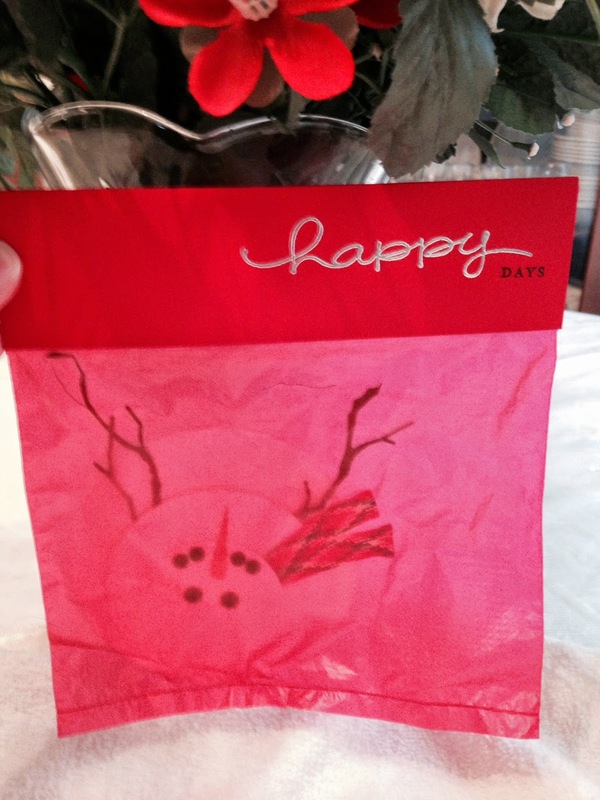 Cheryl made this really cute snowman card. He came in his own little red bag. This was my little one's favourite. She keeps it in her little purse. 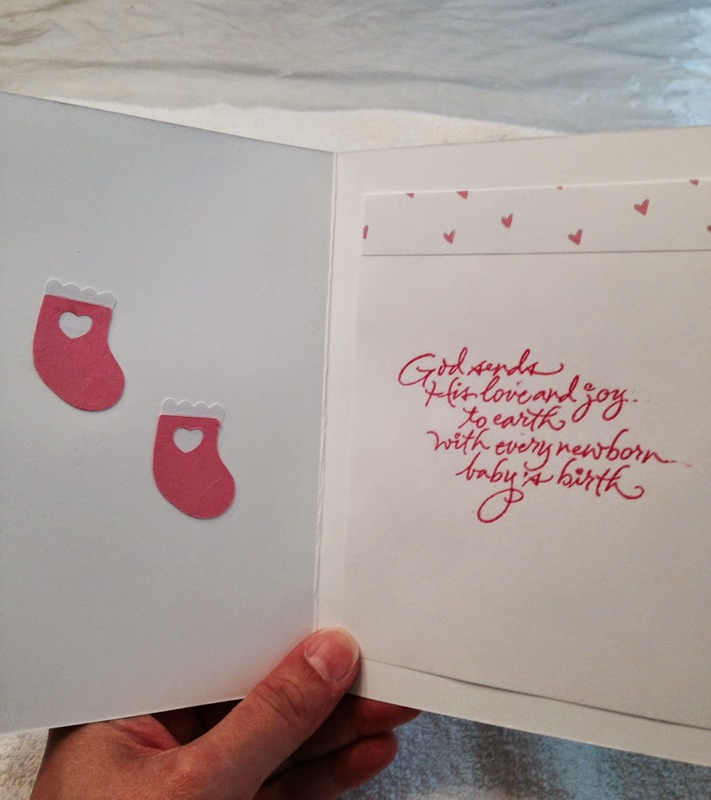 This was a really cute card Cheryl. 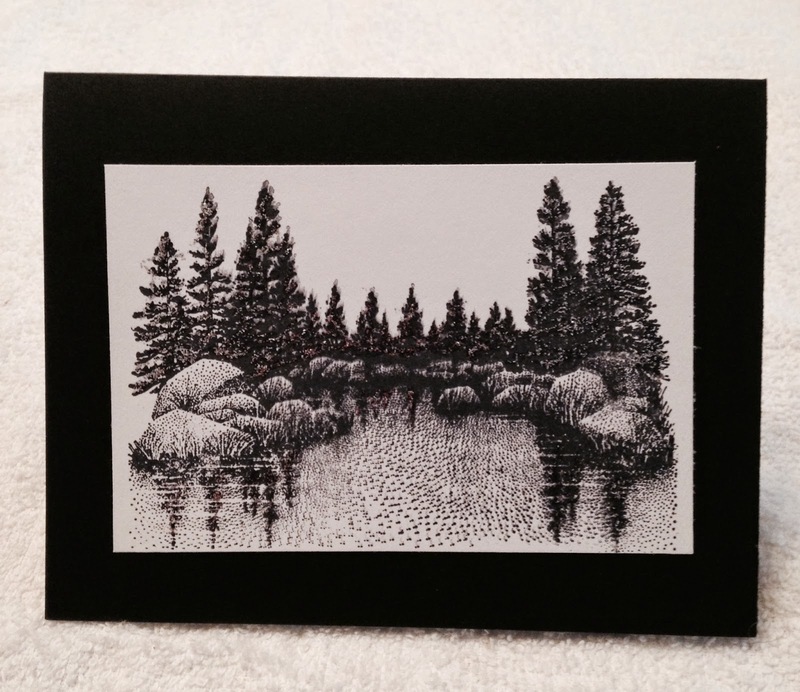 Debbie made this really incredible easel card. It has a vintage feel to it. 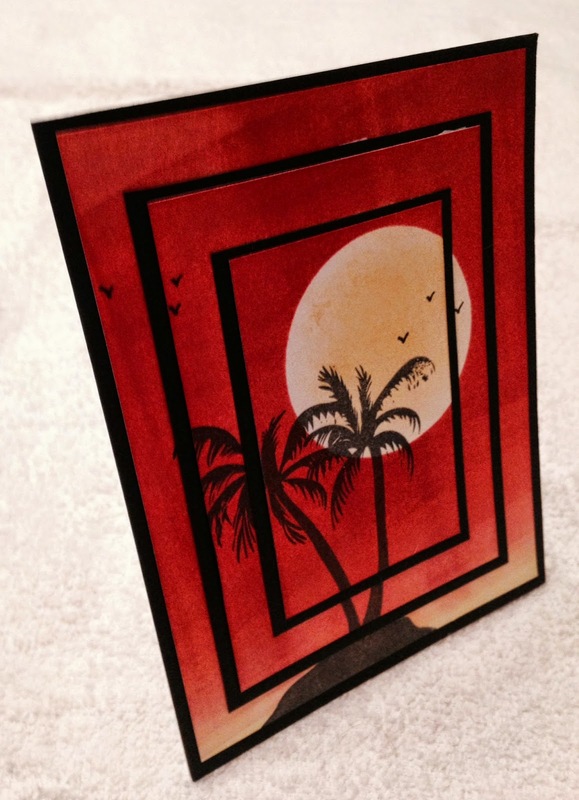 Beautiful card Debbie!